In the above position, after 27. Bd2 Kh8 28. Ba5? ?, how many ways does black have to win? This is what I contemplated for about 20 minutes after missing the move(s) and letting the win slip away along with my team's chances of winning the U1800 title. Excuse me while I bang my head against the table for awhile. This postponed game from last night again validates the exchange French as an attacking weapon nonpareil. Analysis is not computer-assisted, so consume at risk. 24. BxN NxB (...fxB leads to the same) 25. NxP+ PxN 26. RxN+ PxB 27. QxP+ 1/2-1/2 with perpetual check to follow, the coward's way out. This brings my total in the exchange French to 1 win, 0 losses and many, many draws. First the good news: a rare short win this weekend at the USATE where my opponent assisted me on a nice combination...in the following position he played 11...QxN (forced) and after 12. Bc4 Qxd4?? 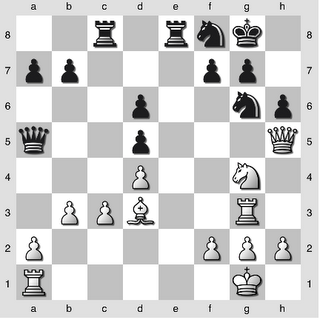 there is a forced win of black's queen in 3. A painful missed opportunity will be posted later. In reviewing my openings in preparation for USATE, I have finally made my way to the question of what to play against Bird's Opening (1.f4)? 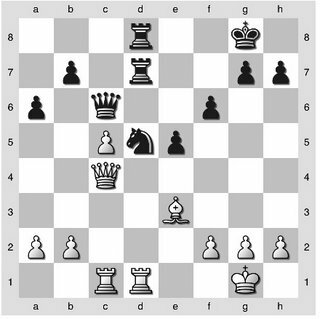 On those rare occasions when I encounter it, I have been playing the Schlechter's Gambit 1.f4 e5 2.fxe5 Nc6, but a review of lines at the French site "L'Ouverture Bird" has been rather discouraging. And I have to ask myself, "Why play something risky against somebody foolish enough to play 1.f4 anyway?" 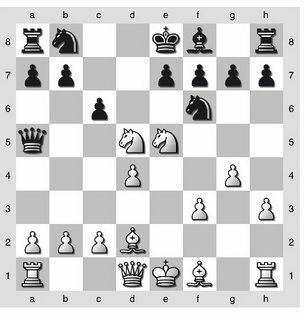 There is always Kasparov's choice (see Romanishin - Kasparov, Leningrad 1976) of 1.f4 d5 2.Nf3 Nf6 3.e3 Bg4 4.b3 Nbd7 5.Bb2 c6 6.Be2 Qc7 7.O-O Bxf3 8.Bxf3 e5, which looks reasonable. What USATE Teams Do We Have? FM Steve Stoyko is leading the Kenilworth Chess Club A team again this year, with the same members as last year: NM Scott Massey, NM Ed Allen, expert Bob Rose and expert Mike Goeller as alternate. Last year we finished 5-1, losing only to the infamous "GGGg" team. What other teams have Kenilworth Chess Club members? How many "Chessaholics" teams is Mike Wojcio putting together? Use the comments to answer, or if someone wants to give a complete listing in a post that would be great. Welcome to our new blog for interested members of the Kenilworth Chess Club community. Use this blog to post information of interest to other members and the larger chess community, including opening analysis, recent games, news, and club notes. If you are interested in writing in this space, contact our webmaster, Michael Goeller, or any Kenilworth Chess Club officer.